Bamboo has become the "it" product of the 21st century. The uses of the plant are almost innumerable, from fabrics to building supplies to toothpicks. The sustainable aspect is appealing, since bamboo grows about 4 feet per day and is a renewable resource. Production of the material requires soil, water and sunlight and very little else. Bamboo plantations have sprung up in tropical and semitropical countries and offer an economic shot in the arm to some of the more depressed regions of the world. The manufacture of bamboo into complex and varied products is another important industry that can favorably impact the export businesses of many countries. Every product requires a different manufacturing process and therefore a different workforce and facility, creating jobs and enlivening lifestyles. Bamboo has a natural antimicrobial property and can be made into durable textiles and yarns. The fiber for the fabric comes from inside the bamboo and is composed of cellulose. The fiber is separated mechanically and then chemically treated with sodium hydroxide. Carbon disulfide binds the fibers, and then they are chemically bleached. None of this is environmentally friendly, but so far it is the preferred method. In another manufacturing process, the whole fiber is extracted without chemicals. Natural enzymes are added to crushed bamboo, which breaks down the material so fibers can be combed out. This is much more time-consuming and expensive but yields the organic bamboo textiles. Composite and flooring comes from the stalk of the bamboo plant, which needs to be at least six years old before it is harvested. The stalks are split and sliced, just as in any timber production. Then the bamboo logs are sometimes steamed to deepen the color, but this may reduce the hardness of the end product. There are few regulating bodies for the manufacture of bamboo, so it's "buyer beware." The bamboo is next kiln-dried; then the process of gluing the pieces together to assemble flooring or composite begins. Often large amounts of formaldehyde, which is a toxic material, are used in the glues. Finally, the assembled pieces are milled to sizes needed and then finished. The manufacturing processes on both the main bamboo products raise concerns regarding the safety of the products, due to the chemicals used. Additionally, the procedures create toxic byproducts, which go into waters and the air. The use of bamboo to replace traditional woods was a winning idea until it became apparent that farmers in some areas are abandoning needed food crops to farm the more profitable bamboo. 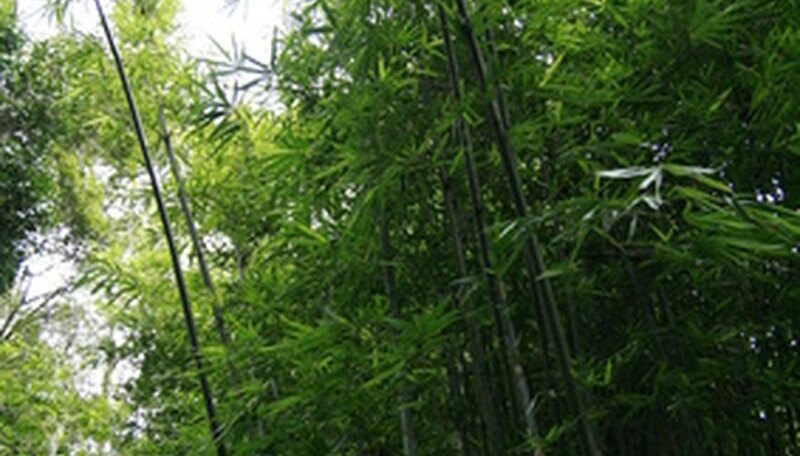 Bamboo is primarily grown in countries with no regulations or standards. This means the increased use of the product will serve to augment pollution, displace important daily crops and even threaten human health. Industry-wide organizations have not banded together to protect consumers, workers and the environment. Some level of integrity needs to accompany the product to enhance its continued growth as a politically correct fiber choice. Government regulations could place responsibility on manufacturers to remedy potentially hazardous processing. Buyers need to research their choice of products to verify that the growth, harvest and processing was done under ethical stewardship. Bamboo remains a positive alternative to cotton and other fibers that require more land and resources. With proper management, it has the potential to become the fiber of the future. Awakened Aesthetic: How Green Is Your Bamboo? The Guardian: Can Bamboo Save Our Forests and Help End Poverty?